First full day on the boat: game on! Household linens are in storage (somewhere). Now that we are living without air conditioning I need some hot-weather clothes. 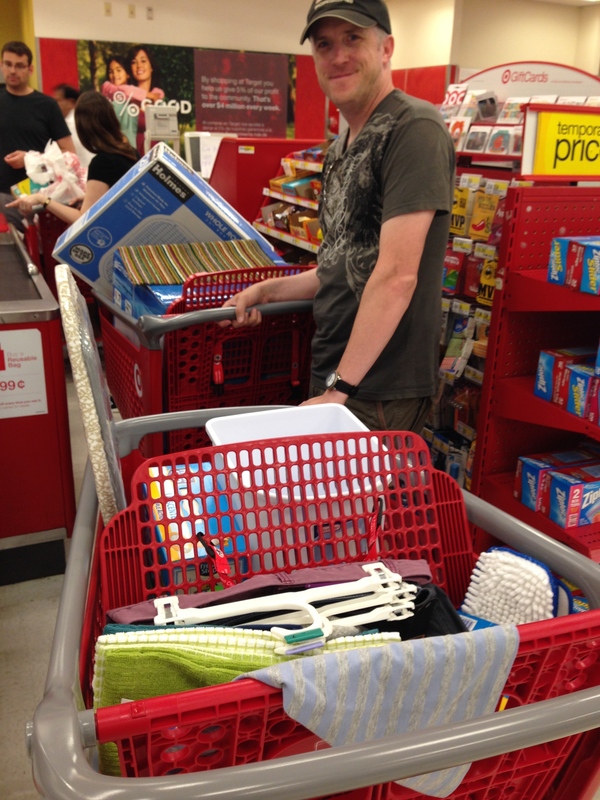 Here is a picture of my Better Half with our two carts that we had filled to the brim with important items. wait, we want to have less stuff, not more stuff! The fridge just fit in the empty fridge hole on the boat. It’s the size of a portable safe but it’s nice to have cold milk and eggs and butter. It’s been decided that I can’t live without a fridge… It will do until I can buy my dream refrigerator in the distant future. Everything we bought was useful and necessary (well, maybe not the green dish towels, but a girl needs some brightness!). Welcome to our boat, stuff!